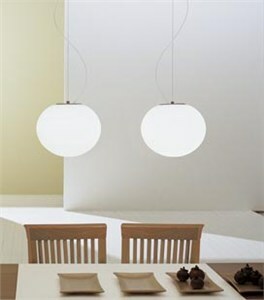 DESCRIPTION Pendant fixture providing upward, downward and diffused illumination from its elliptically-shaped Murano glass diffuser. Companion wall, floor and table lamps also available. CONSTRUCTION: Chrome stem and canopy, which mount to a standard junction box, hold the diffuser in place. The line-voltage halogen light source is concealed within a frosted glass cylinder. Available in three stem lengths. LIGHT SOURCE: 1 x 200 watts, quartz halogen, recessed single contact (provided). FINISHES: Canopy: Chrome Plated polycarbonate. Stem: Polished Chrome plated metal. GLASS COLOR: Satin White, Satin Red, Satin Cobalt Blue, Satin Amber, Satin Nile Green.